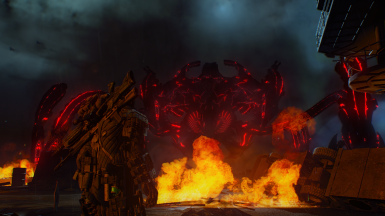 I've found the Red Hunter from Crysis Warhead to be a very cool boss and have often wished it was possible to have that Hunter in Crysis 1. I originally tried a long time ago, back when I had no experience in making mods and it didn't work at all. Years later however, armed with the knowledge I know now, I tried again... and I succeeded. It was far from easy though. In my first successful attempts, the Red Hunter worked, but it was very buggy. The front right leg always behaved oddly when moving, the shield outline appeared constantly on the face, it always hovered a bit above the ground, and the footsteps didn't work. But I didn't give up. I persevered and eventually I manged to fix MOST of these issues. Turned out when I put the Hunter animations from Warhead in the Crysis 1 directory, that fixed the issues with legs and footsteps. The shield I managed to fix by just deleting it completely. Not perfect, I know, but it's the only solution I could think of. So for now, when you shoot the Red Hunter while it has it's shield up, you don't' see the shield. I will attempt to find a way of fixing it for good though. Another thing I've also been able to do is add the Red Hunter's cannons on as attachments. They don't work I'm afraid, they're just attached so that the Hunter looks like how it does in Warhead. 14/11/15 Update: Found a better way doing this mod that fixed the big bugs. Rather than try to get the rogina Red Hunter model working, I instead took the original Hunter model from Crysis 1 that worked properly, and then modded that into the Red Hunter by simply adding on all the attachments and changing the materials. So now, this mod is actually a modified version of the original Hunter, rather than the actual model from Warhead. The explosion bug is now completely fixed, I've added on the arms at the back, and I've also replaced the tail since I found out the Red Hunter actually has a different one compared to the blue ones. Another thing I'm now trying to work on is change the color of the Hunter's debris when ti explodes since they're still blue. 15/11/15 Update: I did it! I not only managed to change the debris color to red, but I also managed to add the Red Hunter's health and stats from Warhead! In doing so, this has also increased it's damage, awareness and has even unlocked it. It will still remain stationary, but now when you shoot at it from behind, it will turn to face you. IMPORTANT NOTE: In order for the stats and health to take effect, you need to either restart the fleet level from the beginning, or load a save from before the Hunter is spawned, otherwise it'll use the same health and stats it had from the save. Also found out that the size doesn't actually need to be changed. Turns out the Red Hunter is exactly the same size in Warhead as a normal Hunter. It just looked small to me in Crysis 1 because I had my field of view set incorrectly. At default FOV, the Hunter now looks much bigger. The shield I'm afraid is still not working properly, so that's still removed entirely. A shame I know, but trust me it's better than having a constant blue aura surrounding the Hunter's face. 18/11/15 Update: I found a small issue with the stats file that caused the Trooper leader to not appear, so I've fixed that and I've also added a little something extra. After coming across an image I decided to include a blue version of the Red Hunter. Amazingly, the shield actually works properly when using that one, so that gives me something to think about while trying to fix the shield for the Red version. I've updated the download to now include a blue version as well. I've also split the mod up into two files and included installation instructions. The Exodus one replaces the Hunter in the Exodus and core level. The fleet one, replaces the Hunter in the fleet mission. And the second gives the Hunter the health it has in it's actual file and also has in game when it spawns.... 50000. I'll tell you right now, with that much health, the Hunter is virtually unbeatable. I've tried many times, and always failed. Point is, the version marked IMPOSSIBLE is only for those who want to try it out or are looking for an almost impossiblechallenge. After some experimenting, I found a way to allow the Red Hunter's extra attachments to be shot off and destroyed in the same way that the pieces of the mouth of a normal hunter can. Even applied it to the turrets and everything, thus making the boss fight all the more like the one in Warhead. I also added a file that makes a small change to the Red Hunter's animations. I noticed that the fleet Hunter always seems to raise itself up during the boss fight. For me, that doesn't really look as good as the low down one. So I did some digging and eventually found the file that dictates what animations the Hunter uses. Rather than go through the complicated progress of editing and renaming animations, I instead just changed the list in the file. SO now, when the Hunter tried to use HIGH animations, it will now always remain low. As a result, this not only looks better and better matches the read Red Hunter's behaviour, it also woks better with the stats I included. I also finally fixed the shield glitch at long last for NEARLY all the models. The only one where the shield still doesn't' work is the Blue Hunter in Exodus when using the Red Fleet only version of the mod. And finally on a rather minor note, I realigned the tail turret since I found I actually had it slightly wrong before.